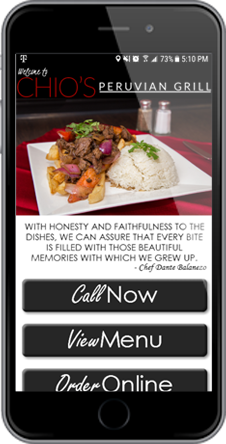 Get a custom built mobile web app with your restaurant theme! When customers want to check out your website on their mobile device (smartphone or tablet), now you can say “we’ve got an app for that.”Mobile food ordering allows you to be able to present customers with a special mobile-ready version of your website that provides a user experience designed for a compact screen. Image Slider: A few of your favorite images will rotate to visitors as soon as your mobile web app loads. Use photos of your great food, restaurant interior, employees, guests, etc. to tease out a taste of your unique dining experience. Contact Form: Customer feedback is vital for any business to succeed. Not only is your restaurant phone number an active link, but a contact form is also provided that sends you an email when visitors share their questions or comments. Google Map: An integrated Google Map allows customers to get directions to your restaurant with a few simple clicks. Embedded Videos: If a picture paints a thousand words, then a video must be worth millions. Your Youtube and Vimeo streaming videos can be played without leaving the mobile web app. Search Engine Optimization: Your website is only useful if customers can find it. Our SEO experts will employ the latest strategies to push your mobile web app to the top! Call us today at 813-549-7010 to speak with one of our sales associates and start setting up your mobile web app today. You can also use the contact form by clicking the button below.